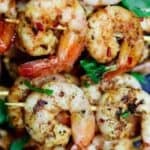 Easy grilled shrimp skewers, seasoned Mediterranean-style and marinated in olive oil and lemon juice. A flavor-packed Mediterranean appetizer in minutes! For a girl who grew up blocks away from the Mediterranean, I’ve always had a soft spot for shrimp (and all seafood for that matter). And these shrimp skewers are one of my favorite ways to serve as an appetizer. 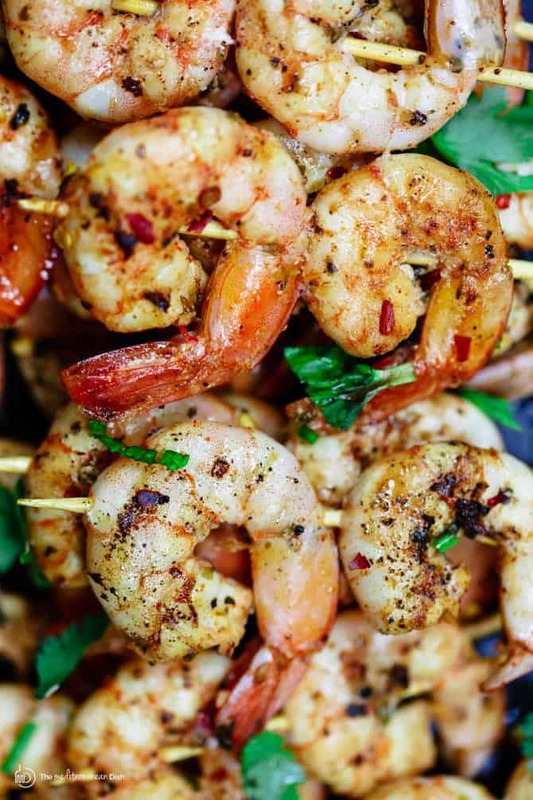 In this quick recipe, the shrimp are seasoned very simply with oregano, sweet paprika, salt and pepper. 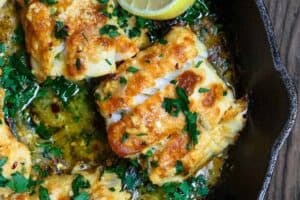 Here, I rely more on fresh garlic paste and an olive oil-citrus marinade. And if you have time, it’s best to let the shrimp marinate for about 1 hour or so in the fridge. 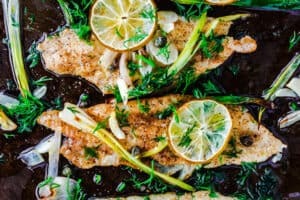 I make this recipe all year round because it doesn’t require an outdoor grill. 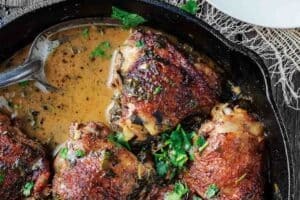 Most of the time, I use a cast iron grill or skillet like this one. It’s important to remember that even large shrimp cooks very quickly. And it’s easy to know when the shrimp skewers are ready. Once the shrimp have turned a pearly-pink color and the tails are bright red, as you see in the pictures, they are ready. The shrimp should be firm enough, but not too firm that they become rubbery. 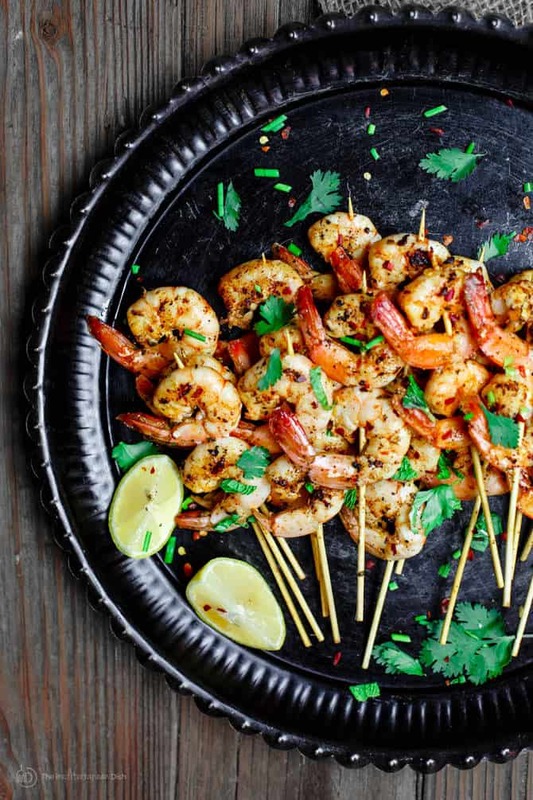 You can turn these shrimp skewers into dinner, if you like. 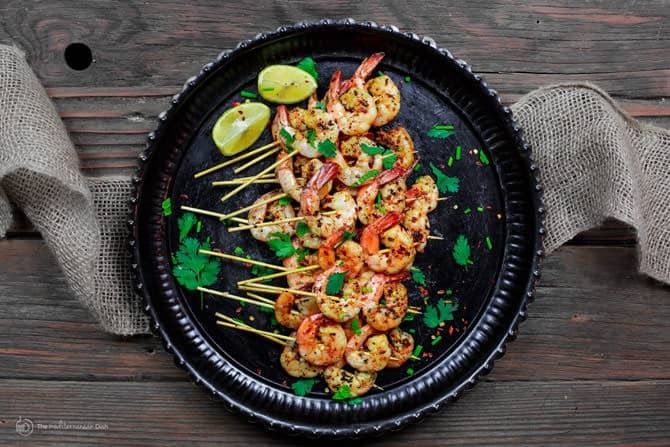 Simply use longer skewers to fit more shrimp, and add a side of Lebanese rice and any Mediterranean salad like fattoush, tabouli or Greek salad for a simple meal. Place the shrimp in a large bowl. Add the garlic paste. Season with the oregano, sweet paprika, salt and pepper. Toss to combine. Add the olive oil and lemon juice. Toss again to combine, making sure the shrimp is well coated. Cover and refrigerate for 1 hour. Meanwhile, soak 12-15 small skewers in water. Remove from the shrimp from the fridge. Thread 2-3 shrimp on each damp skewer. Very lightly brush a cast iron griddle or grill skillet like this one with oil. Heat the skillet on medium-high. Grill the shrimp on the griddle for 5-7 minutes, turning over once halfway through. Place the shrimp skewers on a serving platter. Add a little crushed red pepper and fresh parsley for garnish, if you like. Enjoy! 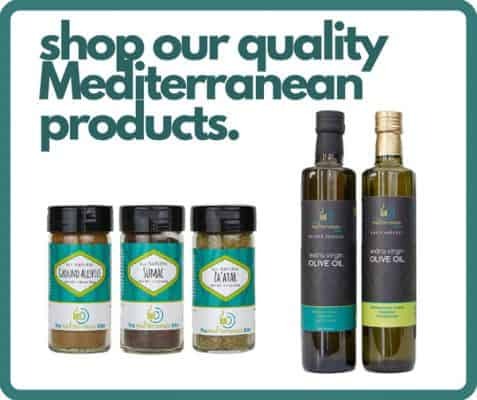 Visit The Mediterranean Dish Shop today for quality extra virgin olive oils, Mediterranean spices and more! Super delicious! This is the easiest way to cook shrimp with a lot of flavors. 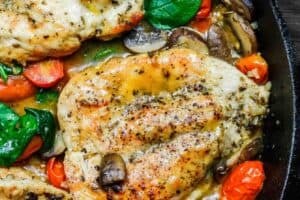 Is the garlic paste a product you buy? Or just take some garlic cloves and smash them into a paste? Hi, Eric. 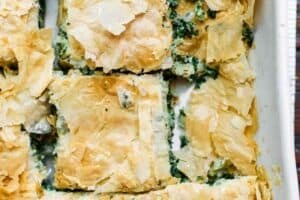 For this recipe, you can buy garlic paste or smash 3-4 large garlic cloves into a paste. Thanks for your good question! I love shrimp! These look amazing! Glad you stopped in today, then! I hope you’ll give these a try! These scrim skewers are gorgeous! These would be the perfect appetizer at our holiday party… Thank you for the inspiration! Glad you like them, Kristine! Enjoy! I love shrimp skewers of all types. This Mediterranean style sounds wonderful. 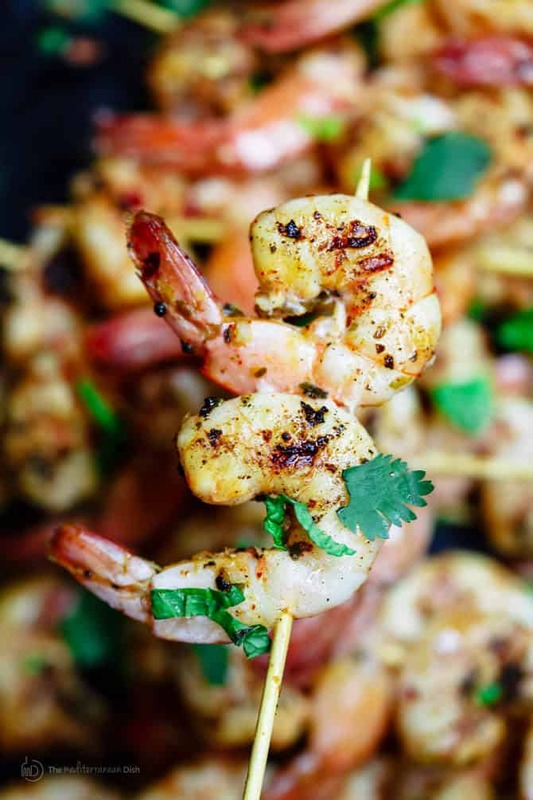 I’m going to check out your shrimp skewers with roasted garlic cilantro sauce, too! My mouth just flooded with saliva when this page loaded! Oh my, I’d be in a lot of trouble if this were served at a party – I’d probably tip the entire plate into my bag and run the hell out of there! Lol! The visual of you running away with a bunch of shrimp skewers made me laugh! Thanks for stopping in, Tina! I need to make these this week. I can totally see how they would be great for an appetizer or for a dinner! Yummy yummy! Thanks for the menu idea! Awesome, Debi! I hope you enjoy them!